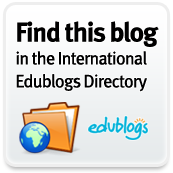 If you are concerned with privacy and do not have the option to have Edublogs Pro for free, you may want to create a KidBlog. Type in your “Display Name” as you would like it to appear for your students. The Verification Code is the anti-spam part. Type in the code so the site knows you are not spam. Then click the orange “Create Class” button. Or choose, “Sign up with Google” if you have a Google account that you would like linked to this blog. Let’s take a look at the Privacy Settings now. It looks like we now have a difference between KidBlog and Edublogs. If you pay for the PRO features in Edublogs, you have the option to make your site private by creating a password for people to enter. 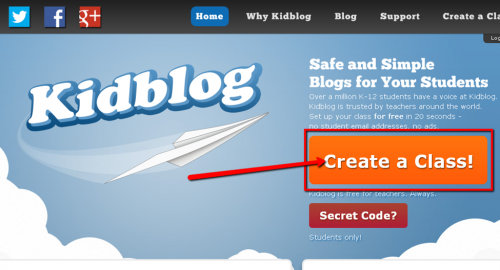 There is no Password only option in KidBlog. 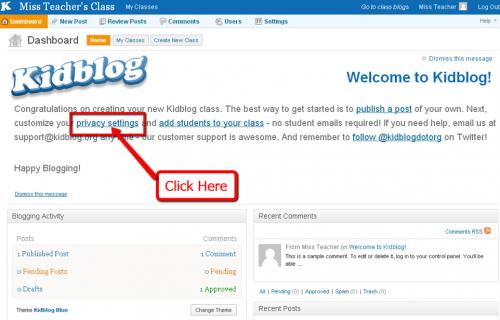 You will need to add each student as a user for your blog. That will mean that from year to year you will have to delete and re-enter new students and their families. If you want privacy, than this will be worth it. Keep the “Users in the following class(es):” selected. 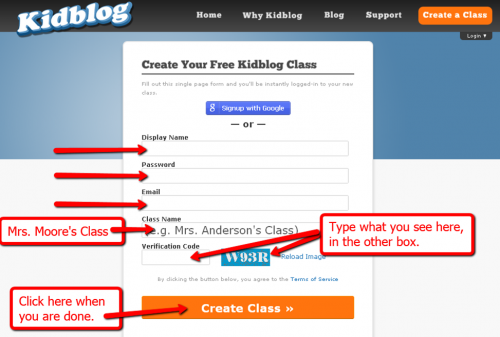 This means that only the Users you enroll will be able to read your blog posts, just like this blog. 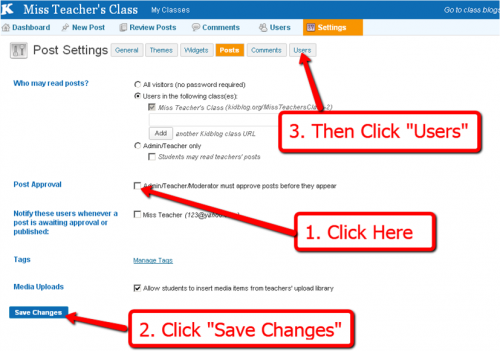 Check the “Admin/Teacher/Moderator must approve posts before they appear” box if you plan to allow the students to create posts. “Media Uploads” are the same idea. If you are going to allow the students to upload images, leave this box checked. Enter the first child’s name as you would like it to appear on the website. Create a password for them. 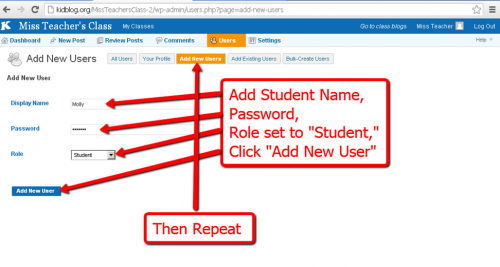 Make sure the “Role” of the user is set to “Student.” Then click “Add New User” and repeat the process for every student in your class. 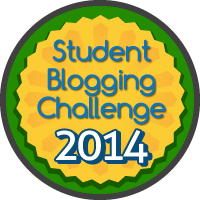 What ideas do you have for using a classroom blog?